First, increasing cairo scaled font cache size: You saw a 230 KB process size increase when increasing cache size from 256 to 2048. Well, here's a little secret I decided not to disclose until someone notices it, and you kinda qualify now: Cairo doesn't free glyph renderings after uploading them to the X server! You definitely need them if you are using the image surface, but most processes don't. So, you've got the smart X server hashing and reusing glyph renderings, and cairo-using processes keeping a copy around, for no good. Fix that and happily increase cache size to 2048 without 230 KB size increase! Make output buffer copy/swap'ing during GSUB processing lazy, such that if a lookup doesn't affect a glyph string, no glyph copying takes place. Compile all of HarfBuzz as a single file, to let compiler do more optimizations. This increased HarfBuzz binary size from 100 KB to 150 KB. Compiling with -Os brings it down to 70 KB. May be worth profiling with -Os too. Last but not least, cache one HB_Buffer. 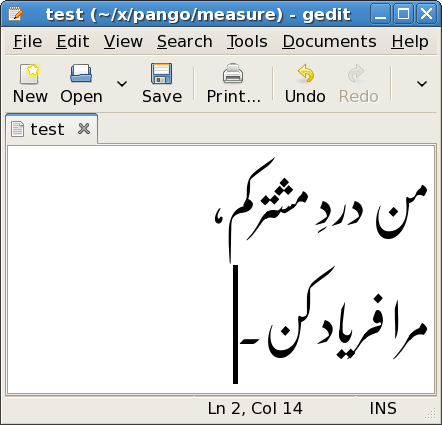 All in all, in my measurements, these three made repeated text layout 10 to 20 percent faster for 1) very long paragraphs, and 2) using fonts with many many looksup like Nafees Nastaliq (more than 100). They made no difference for regular small text+font combinations. AFF jump from 15000ft, Adventure Center Skydiving in Hollister, California this time. For comparison, my first jump was static-line from 3000ft, Parachute School of Toronto in Simcoe, Ontario.